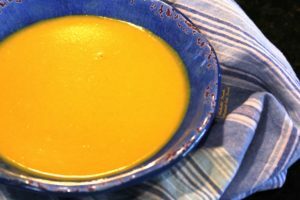 Creamy Curried Acorn Squash Soup is a delicious, healthy, vegetarian option for lunch or a light dinner. Or, serve it in shot glasses for a fun party appetizer. I feel as though the summer absolutely flew by. As a result, I’ve been dragging my feet a little bit about the appearance of pumpkin-spiced-everything and Christmas decorations—did we skip Halloween?! Don’t get me wrong: I do love autumn, and I’ll get in the spirit soon. Just give me a few more weeks of warm weather…I still have tomatillos holding on for dear life! On the brighter side, one of my favorite things about autumn and cooler weather is making and consuming large quantities of SOUP—especially soups involving squash: their very color makes me think of autumn leaves and bonfires. I don’t think that Phil had ever tried any sort of squash soup before he met me. But I knew that I must have been doing something right when, at the grocery store the other day, I looked up to see my hubster trotting back to the shopping cart carrying a ginormous acorn squash. I won’t lie: this was a proud moment. 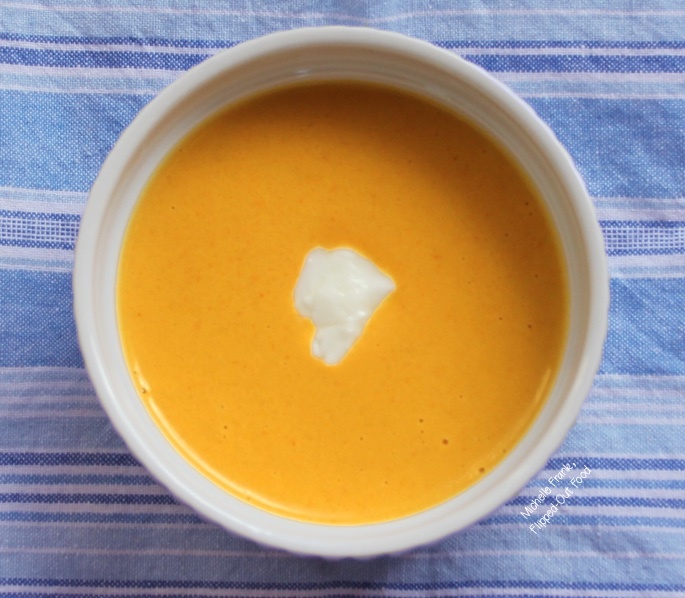 The previous version of squash soup I’d made was Ginger-Turmeric Butternut Squash Soup. This time, the hubster wanted me to make something spicy with acorn squash. Challenge accepted! Curried Acorn Squash Soup was born. I knew right away that I’d go with a curried squash soup. Since the hubster’s definition of spicy might be more accurately described as nuclear by most people’s standards, I decided to also add 2 Thai bird chilis to the mix. Only do this if you are a chili head. Also with that spicy factor in mind, I’d recommend starting out with only a small amount of curry paste if you’re concerned. I used a store-bought Massaman curry paste, although red curry paste will also work well. I used 1 1/2 tablespoons of paste, which, in combination with the chilis, produced a soup that was quite hot but still delicious. Tread carefully with the curry paste. You can always add more later. This noise indicates that your squash is about to explode. Don’t worry! The worst that will happen is a loud BOOM and a mess. (And believe me: I’ve done it more times than I’m comfortable telling you.) If you hear hissing/squealing sounds emanating from your microwave, simply turn it off—but don’t open the door until the squash settles down. You want the squash to be very, very soft. Give the squash 30 seconds or so to decide that it’s not going to explode before you open the door, and then carefully poke it with a paring knife or your finger (careful, it’s HOT!). If it’s not quite there, nuke the squash for another couple of minutes (again, listen for the pre-explosion noises!). While the squash is in the microwave, I start sautéeing my aromatics, letting them soften with a bit of olive oil in my Dutch oven. When the squash has softened, I remove it to a cutting board and carefully cut it in half (you might want to put an oven mitt on the hand that isn’t holding the knife). Then, I simply use a serving spoon to scoop out and discard the seeds and scoop the flesh of the squash away from the skin. No need to chop it: I just add the squash directly to the pot. I break up the squash a bit with a wooden spoon while letting it sweat a bit with the other vegetables. Then I move the veggies to the sides of the pot and add some coconut cream and curry paste to the middle, letting the mixture sauté until fragrant. Then I add the rest of the coconut milk and simmer the mixture for 20 minutes. I like to use an immersion blender to purée the soup inside the containers I use to store the leftovers (I use the containers shown in my Amazon affiliate link below the recipe). You can also use a food processor or a blender—carefully. I love to serve the soup with a dollop of fat-free Greek yogurt, which I stir in slowly as I eat. The yogurt not only imparts additional creaminess to the soup, but also adds a wonderful, bright touch of tartness to the flavor. This soup would make a great holiday dinner appetizer: I love to serve blended soups in shot glasses. Speaking of holiday dinners: if you’re planning to host one, check out my Work-Ahead Thanksgiving Dinner Meal Plan (which obvs works for any holiday dinner!)! I hope that this healthy, autumn-infused soup will be a hit with your family. And with that, I’ll sign off and join the queue for a pumpkin-spiced latte. I am linking up my Curried Acorn Squash Soup recipe with my favorite food blogger recipe-sharing link parties, #CookBlogShare and #CookOnceEatTwice (coming soon! ), and #BrillBlogPosts (coming soon! ), a link party with fabulous posts covering an array of topics from lifestyle bloggers. Stab the squash in several places with a paring knife to allow steam to vent in the microwave. Place on a microwave-safe plate and microwave for 8 minutes. Pay close attention and listen for squealing sounds (especially after 5 minutes): these indicate that the squash is about to explode. In this case, turn off the microwave and let the squash sit for thirty seconds to a minute (don't open the door). Then resume microwaving (and listening carefully), up to 10 minutes or until the squash is very soft. Add the olive oil* to a large, heavy-bottomed pot or Dutch oven over medium heat. When the oil is shimmering, add the shallots, carrots, garlic, Thai chilies, and ginger. Reduce heat to medium-low and sweat the vegetables until soft but not caramelized, about 10 minutes. Meanwhile, prepare the acorn squash. Cut the top off and slice the squash in half lengthwise. Use a large spoon to scoop the seeds and fibrous innards from the cavity. Discard. Scoop the flesh out of the skin of the squash and into the pot; continue sweating the vegetables, breaking up the squash with a wooden spoon, for an additional 5 minutes. Move the vegetables to the sides of the pot. Scoop the cream from the top of the unshaken can of coconut milk and add to the center of the pot along with the curry paste. Mix the curry paste into the coconut cream and sauté until fragrant. Add the remaining coconut milk and salt. Simmer the soup over medium-low heat for 20 minutes. Turn off the heat and let cool for 5 minutes. Use an immersion blender, food processor, or blender to carefully purée*** the hot soup until silky smooth. Serve with a teaspoon of Greek yogurt on top. Enjoy! *If you are cooking oil-free, substitute ¼ cup of vegetable broth or water for the oil, adding additional water as needed until the vegetables are softened. **A great vegan option for the Massaman curry paste is this recipe by Nicole over at Yumsome. ***Use extreme caution when puréeing or blending soup to avoid burns. Especially if you are using a blender: steam can cause the top of the blender to fly off and soup to splatter everywhere. Fill the blender only halfway to the fill line and remove the stopper or cap from the blender's lid. Use a kitchen towel to hold the top of the blender on. Blend in batches. 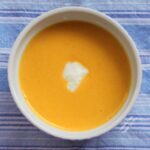 Ginger-Turmeric Butternut Squash Soup: a silky, delicious vegetarian/vegan dish that’s easy to make and takes just a few ingredients. The gorgeously colored soup is perfect for a lunch or light dinner. Now you’ve put me in a pickle….I have an acorn squash sitting on my counter that I was planning to bake with chopped pears, brown sugar and cream. Now, now I see this and I don’t think that will happen. I’m gonna have to stick this baby in my pressure cooker and try this soup out! Thank you, Eb! I’m sure I didn’t think it was quite so funny when it happened, but I do get a good laugh out of it now! Thank you, Kirsty! It’s a cold one today and I just happen to have a squash in my kitchen, so this is going to be on the menu tonight! This looks amazing!!! 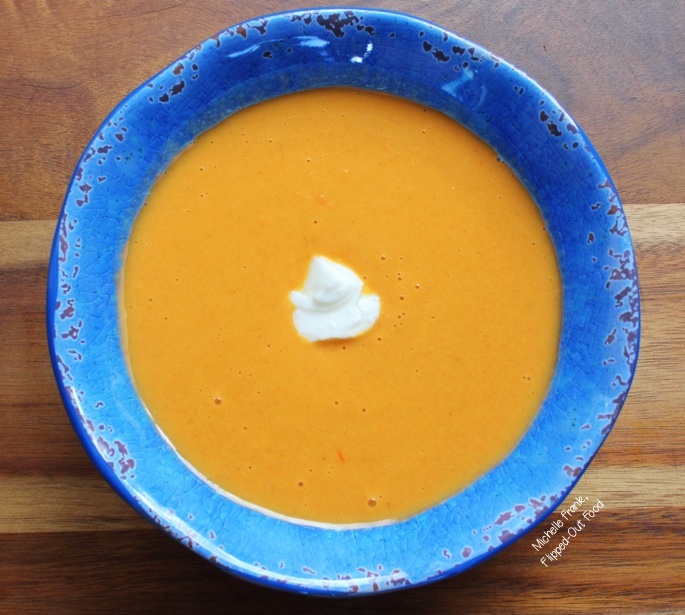 Oh how I love me some squash soup and your ingredients sound Fall fantastic and Flavorful! !